To celebrate its 28th anniversary in space the NASA/ESA Hubble Space Telescope took this amazing and colorful image of the Lagoon Nebula. 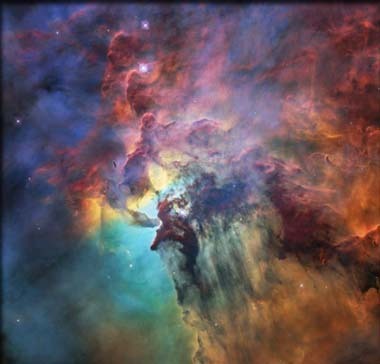 Hubble Celebrates 28th Anniversary With A Trip Through The Lagoon Nebula - This colourful cloud of glowing interstellar gas is just a tiny part of the Lagoon Nebula, a vast stellar nursery. This nebula is a region full of intense activity, with fierce winds from hot stars, swirling chimneys of gas, and energetic star formation all embedded within a hazy labyrinth of gas and dust. Hubble used both its optical and infrared instruments to study the nebula, which was observed to celebrate Hubble's 28th anniversary. Since its launch on 24 April 1990, the NASA/ESA Hubble Space Telescope has revolutionised almost every area of observational astronomy. It has offered a new view of the Universe and has reached and surpassed all expectations for a remarkable 28 years. To celebrate Hubble's legacy and the long international partnership that makes it possible, each year ESA and NASA celebrate the telescope's birthday with a spectacular new image. This year's anniversary image features an object that has already been observed several times in the past: the Lagoon Nebula. The Lagoon Nebula is a colossal object 55 light-year wide and 20 light-years tall. Even though it is about 4000 light-years away from Earth, it is three times larger in the sky than the full Moon. It is even visible to the naked eye in clear, dark skies. 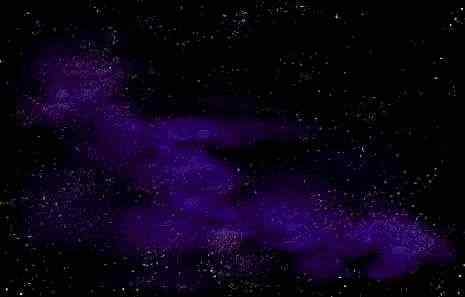 Since it is relatively huge on the night sky, Hubble is only able to capture a small fraction of the total nebula. This image is only about four light-years across, but it shows stunning details. Ancient Large-Mammal Extinctions Linked To Humans - Homo sapiens, Neanderthals and other recent human relatives may have begun hunting large mammal species down to size - by way of extinction - at least 90,000 years earlier than previously thought, says a new study published in the journal Science. Elephant-dwarfing wooly mammoths, elephant-sized ground sloths and various saber-toothed cats highlighted the array of massive mammals roaming Earth between 2.6 million and 12,000 years ago. Prior research suggested that such large mammals began disappearing faster than their smaller counterparts - a phenomenon known as size-biased extinction - in Australia around 35,000 years ago. With the help of emerging data from older fossil and rock records, the new study estimated that this size-biased extinction started at least 125,000 years ago in Africa. By that point, the average African mammal was already 50 percent smaller than those on other continents, the study reported, despite the fact that larger landmasses can typically support larger mammals. Why Did Neanderthals Have Big Noses? They Needed More Air. - Scientists have long wondered why the physical traits of Neanderthals, the ancestors of modern humans, differ greatly from today's man. As published in the April 4 edition of Proceedings of the Royal Society B, an international research team may have the answer. "The physical variations between modern man and 'cavemen' have caused Neanderthals to be historically characterized as barbarous, dimwitted and generally inferior to the contemporary human in almost every way," said Jason Bourke, Ph.D., assistant professor of Anatomy at NYITCOM at A-State and the fluid dynamics expert on the international research team. "Yet, as we learn more about their diet, spiritual beliefs, and behavior, we realize that Neanderthals were likely more sophisticated than previously assumed� Now the question begs, why they looked so different." Aiming to answer that question, the researchers applied sophisticated computer-based methods and simulations to compare the physiological behavior of Neanderthal to today's human. This approach permitted the researchers to ignore the Neanderthals' strong brow ridge (an inherited feature) and focus more on their enlarged nose, which was deemed a unique feature of the species. Existing theories suggest that their large facial structure was required for a stronger bite to eat harder food, but the engineering tests suggested a different reason for these distinctive features. Unlike today's humans, who breathe through a combination of the nose and mouth based on activity level, it appears that Neanderthals relied more on its nose for breathing - a function that would have required a more prominent mid-face. In fact, the reconstructions demonstrated that the Neanderthals' noses were able to transport twice as much air to the lungs than today's humans, which could have powered the more strenuous and energetic lifestyle required to chase and hunt large animals. The ability to condition large amounts of oxygen in colder temperatures would have also allowed Neanderthals to remain warm and active in Ice Age environments. Fight, Flight, Or Freeze: Animal Study Connects Fear Behavior, Rhythmic Breathing, Brain Smell Center. - "Take a deep breath" is the mantra of every anxiety-reducing advice list ever written. And for good reason. There's increasing physiological evidence connecting breathing patterns with the brain regions that control mood and emotion. Now, Minghong Ma, PhD, a professor of Neuroscience in the Perelman School of Medicine at the University of Pennsylvania, and Penn doctoral student Andrew Moberly, have added neurons associated with the olfactory system to the connection between behavior and breathing. These findings are published this week in Nature Communications. Connecting patterns in these interactions may help explain why practices such as meditation and yoga that rely on rhythmic breathing can help people overcome anxiety-based illnesses. "We wanted to know why and how fear behavior, controlled breathing, and smell centers of the brain were connected," Ma said. "What really drives our interest is finding out what we can extrapolate about this relationship to learn about the evolution of behavior and apply this knowledge to help ease the pain associated with such disorders as post-traumatic stress disorder." In earlier studies, Ma found that ends of neurons in the nose have odor sensors as well as the ability to detect the rate of breathing. "The nose really does double duty in its function," Moberly said. "Why and what role does this have in behavior and what does that fear behavior look like in rodents? Their behavioral choices for survival are fight, flight, or freeze." To tease apart these overlapping characteristics, Moberly first trained mice by pairing a specific sound with a light foot shock to induce "freezing" in the normally mobile mice. Freezing behavior is a quiescent period that is unusual for scurrying mice. When he plays the sound associated with the foot shock, "trained" mice literally freeze in their tracks. Knowing that humans have the ability to voluntarily control the breathing patterns, "now the field is asking, how do we breathe differently in different emotional situations," Ma said. "Evolutionarily this makes sense. If a mouse in the wild senses danger by smell, for example, it may freeze and slow down breathing as a survival instinct. Now we want to know how we can apply that knowledge to humans. It would be interesting to find out what breathing patterns are most effective in influencing human brain activity and emotional states"
The notion that you can see the stars during daylight hours from the bottom of a deep well or chimney has been around a long time. The ancient Greek philosopher Aristotle mentions it as does the 19th century author Charles Dickens. However, any theoretical or practical evidence for this seems lacking. The British astronomer Rev. W.F.A. Ellison tried it from the bottom of a bottom of a colliery 900 feet below the surface and found the he wasn't struck by the sight of stars, but the brilliant blue of the sky when compared the darkened tube he was looking up through. We cannot see the stars in the sky during the day because of the sunlight is scattering off gas molecules in the air, sending light in all directions - including into our eyes. (Blue is scattered more than the other colors so that is why the sky is blue). The light radiating this way during day is much brighter than most stars. A few extremely bright stars, like Sirius, are visible in the day if you know where to look, though they do not stand out against the day sky like they do at night. If you were at the bottom of a well shaft, and Sirius was directly overhead during the day, the well shaft might reduce the glare from the sun enough to make the star more visible. It would not, however, allow you to see the fainter stars and the real world chance of Sirius being exactly over your shaft would be extremely small. Similarly planets, like Venus, can be seen in the daylight and viewing them from a well or chimney might reduce the Sun's glare and make them more visible, but you could probably get the same effect by using the cardboard cylinder from a roll of paper towels that you hold up to your eye. Metric System is Born - On May 8th of 1790, the French National Assembly decided to create a simple, stable, decimal system of measurement units. The earliest versions of the meter unit of length was chosen as the length of a pendulum with a half-period of a second but on March 30th of 1791, the Assembly revised the definition to be 1/10 000 000 of the distance between the north pole and the equator. On April 7thof 1795, the Convention decided that the new system was be henceforth the legal measures in France. The metric system adopted prefixes from Greek for multiples and Latin for decimal fractions. Eta Aquarids Shower - The Eta Aquarids shower is capable of producing up to 60 meteors per hour at its peak. Though most its activity is seen in the Southern Hemisphere, in the Northern Hemisphere, it still can produce 30 meteors per hour. The shower is caused by the debris left behind by comet Halley as the Earth crosses it's orbit. The meteors appear annually from April 19 to May 28 and this year peaks the night of May 6 through the 7th. UFO Memorial Needs Moving - A UFO controversy has erupted in a small town in Massachusetts. Officials in Sheffield have ordered the 5,000-pound concrete marker moved for the second time since it was installed in 2015. The marker commemorates an incident in 1969 when 40 residents of the community witnessed a UFO. The monument was funded by donations from community along with some of the 40 witnesses to the alleged event. After it was installed the Town Administrator, Rhonda LaBombard, required it be relocated a few weeks later because it was on town property. It was moved to private property, but now the town is complaining the location is on a public right-of-way easement. "This isn't fair to the community," protested Thom Reed, a witness to the event when he was 9 years-old, to the newspaper, The Eagle. He notes that that LaBombard herself picked the memorial's current location the first time it had to be moved. "She chose the spot herself."